Smith “alumnae” are well represented on film and television. Real Smith alumnae have been portrayed on film as well. Famous chefs, Pulitzer Prize winners, political columnists, environmental researchers, film directors, venture capitalists, physicists, poets, playwrights, CEOs—Smith women apply their learning throughout their lives in thousands of professions and communities. You may have heard of our famous graduates, such as Julia Child, Gloria Steinem and Sylvia Plath. But there are many more stories of leadership and success that demonstrate where the Smith experience can take you. If you’re still not sure where a Smith education can take you, consider our outstanding record of alumnae achievement. 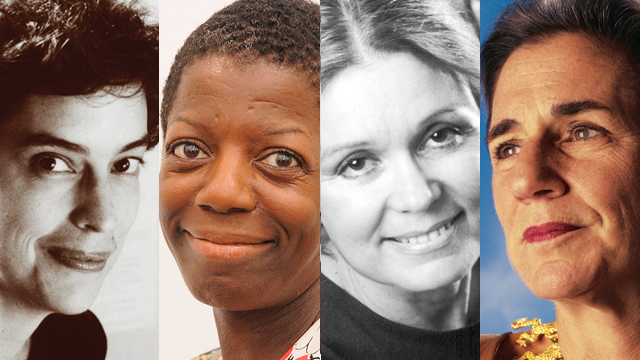 These women are among our accomplished alumnae. Neuroscientist Frances Jensen ’78 explains the impulsive, perplexing and powerful adolescent brain. Indra Rios-Moore ’03 grew up being shuffled from school to school, but the one constant was jazz. Being willing to take a risk at the right time is a key skill for women executives, according to Karen Miller ’84.